Hijab with earrings – Are you an accessories lover and love wearing earrings? Do you also wear hijab? There comes a major problem for all the ladies who cover their head but also prefer wearing earrings. As what earring goes with hijab and how to match them. To all your questions and queries, we bring you plenty of ideas on how to wear earrings with hijab. Wearing a hijab or covering your head does not mean that you can’t wear earrings at all. You can always look out for ways and style them. Loop earrings, long earrings, tussle earrings, gold earrings, they are all in fashion. Pick the one that goes well with your outfit. Accessorizing you hijab well can dramatically change your look. We have already different ideas how to accessories your hijab with jewelry. If you are interested to know several hijab styles in which you can also style earrings with it, then you must scroll down to check the photos and tips. The styles of the headscarves shown in the pictures below are very trendy. 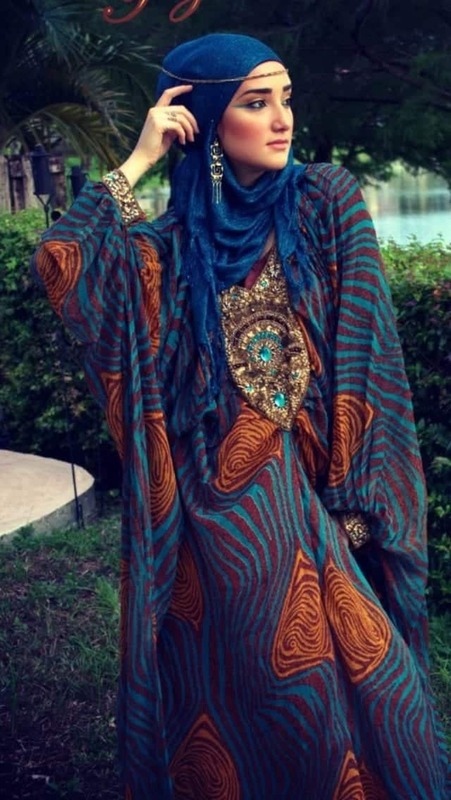 You can easily style your hijab while covering your head and by wearing pretty earrings. Along with that, you can always check for head scarves that match the colour of your earrings. Have a look at the styles below. Kaftan with headband and earrings perfect for a formal dinner look. Long maxi with gorgeous long earrings. Long tussle earrings for a chic style look. Round beaded earrings are looking spectacular for a day look. A simple look for a normal day out, pair of tassel earrings. Wedding day looks hijab style with eastern earrings. High tied hijab and loop earring for a summer look. Eastern wedding day look with beautiful long earrings. Other than the hijab styles, your appearance matters a lot which includes your outfit, shoes, and accessories. With all these ideas, you would absolutely rock your hijab style with perfect earrings, a cute outfit, and a great pair of shoes. You can pull off the look very well. Keep your dress very trendy and feminine. Embroidery and silk material are the best ones to wear to an evening party. They are the hit trends of the season. A gorgeous matching pair of earrings will rock the look. So cure all pic style very beautiful i like it….Explore our curated collection of Ethnic Earrings. A bit confused here. I think all scholars will say wearing hijaab with earrings on display defeats the purpose of hijaab. You could wear them under the hijaab but they cannot be showing. Nor should you wear makeup in front of non mahrem men.